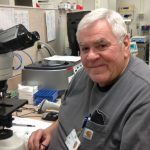 After a half-century with Sutter Coast Hospital, Jerry Cutsforth, clinical laboratory scientist, retires from the hospital after more than 55 years of service. Sutter Coast Hospital staff, friends, patients and physicians gathered to celebrate and honor Jerry and wish him a fond goodbye. 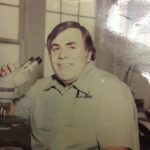 Jerry started his career in the Lab because he enjoyed the hands-on learning and has been there ever since. He said the technological advancements in the field were tremendous in the span of his career, making his job easier and allowing him to be more efficient. Although he still fondly remembers the days when he would count out 100 blood cells on a slide for a blood test. While many things at Sutter Coast have changed in the past 50 years, Jerry’s strong work ethic and friendly personality remained the same. Jerry plans to spend his retirement in Del Norte County with his family, including his 10 grandchildren. He also has become a respected cribbage player and will travel to Reno in March for a tournament. Jerry is the longest tenured Sutter Coast employee and the third most tenured employee in the Sutter Health system. Thank you, Jerry, for being a mentor and guiding force in the SCH Lab. We wish you many years of happiness and success in both your retirement and cribbage matches.